In the 19th century butter pats were used to shape butter into bricks, making butter ready for sale and use. The excess moisture would be squeezed out of the butter, which was then transferred to a wooden board. The butter maker would hold one of these pats in each hand and work the butter into shape. Butter pats and moulds were washed in salted water to help prevent the butter from sticking to them. These wooden pats are thin, light and easy to hold. The inside face is serrated to grip the butter and squeeze out any further water. It was also used to make patterns on the finished butter. The butter was stamped with a wooden stamp or print. The stamps were carved with designs that identified the individual farm dairies. Designs ranged from agricultural motifs, such as wheat ears, primroses and farm animals, to abstract patterns. The stamp in this picture has a simple flower motif. If the butter was made in winter it would usually be paler than summer butter due to the poorer quality of grazing for the cow. Because of this food colouring made from marigolds and carrot water was sometimes added and worked into the butter with the pats. 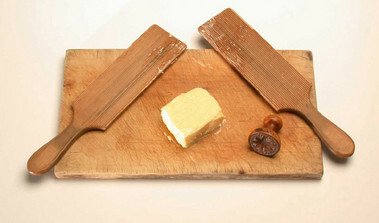 Butter pats are also known as Scotch Hands.